The best thing I can say about Fantastic Four is that it brought Chris Evens into the Marvel fold. He’s fun here as the cocky Johnny Storm/Human Torch, but his career is really on fire as Captain America. If this movie is what it took to convince people he could carry a superhero film, then I’m glad this was made. To be fair, Fantastic Four isn’t the worst superhero movie ever made. It’s just not particularly compelling. The biggest issue is that much of the movie is spent showing the characters developing their powers. I like an origin story as much as the next person, but there needs to be a compelling reason for the protagonists to use their powers. The main confrontation between the Fantastic Four and their nemesis Doctor Doom boils down to Doom wanting revenge for losing his company. Not exactly the stuff of comic legend. The cast is good, with the one exception being Jessica Alba. I’m sure she’s a very lovely person, but it’s clear that she was only cast because she’d look good in the jumpsuit. As a woman this type of casting is insulting, but I hope that even male fans of the comics are equally annoyed. If Alba was more talented then I’d have no issue with her being Sue Storm. Unfortunately every line she delivers is unconvincing. She is definitely not a genetics researcher. Alba also appears too young next to her co-star and love interest, Ioan Gruffudd as Dr Reed Richards. In reality they’re only eight years apart, but Alba’s appearance is just too youthful to convincingly play Gruffudd’s colleague/ex-girlfriend. The one aspect that Fantastic Four spends a lot of time on that I found interesting is how they are embraced by the media. These four are stalked by the paparazzi and fans rather than the police or the government. Threads of this have always run through Superman stories, and was touched upon in Iron Man and The Avengers, but Four (and its sequel) runs with the idea in a fun way. If superheroes were real, they’d definitely grace the covers of tabloids just as often as they lead the nightly news. 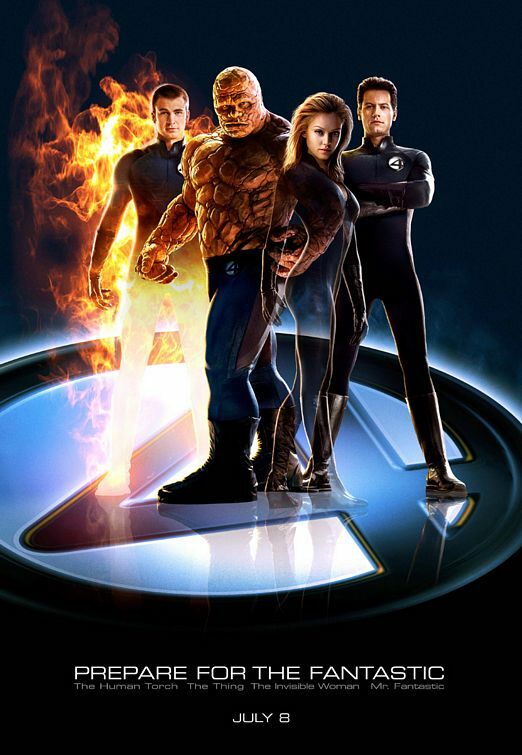 Whenever I watch this film, I am trying to figure out if this is just a poor film or if the Fantastic Four are weak characters and the film reflects this. I have the same feeling about Superman, I find him to be a boring character, which means any film he is in I just can’t get into. I have a feeling the Fantastic Four could be similar, or it could just be that this is possibly one of the worst casted comic book films in recent memory (at least until 2015’s reboot comes out). Jessica Alba is terribly miscast as Sue Storm. She is meant to have blonde hair and blue eyes and be a pale white person. Not a brunette Mexican. I could get behind this casting if Alba had any talent, but unfortunately every line she says in this film feels forced and some of her acting is laughably bad. The blue contacts she is sporting make her look like some sort of alien, it doesn’t look right at all. The rest of the Fantastic Four is ok, but Alba’s performance detracts so much from the film it is hard to think about anything else. For those that don’t know, the Fantastic Four follows scientific genius, Reed Richards (Ioan Gruffudd) and his old friend, Ben Grimm (Michael Chiklis). They request funding from an old rival, Victor Von Doom (Julian McMahon), to go up into space and research cosmic rays that have started appearing there. Doom agrees, on the proviso he accompany them with his current flame and Reed’s former lover, Sue (Alba). Sue’s cocky brother Johnny Storm (Captain America) also comes along for the ride as the ship’s pilot. Once in space, the cosmic rays pass through Doom’s space station and everyone aboard absorbs them, leading to an emergency return to Earth. Once they are back home, Reed, Sue, Ben and Johnny realise they have gained super powers from the cosmic radiation. Reed can bend his body at will, Sue can turn herself invisible and create powerful force fields, Johnny can turn himself into a fireball and fly, while Ben discovers he now has super strength, the downside being his body is now made completely of stone. Victor also gains some new abilities, he can shoot lightning bolts from his hands, and his body is slowly being turned to an organic metal. He takes on the moniker ‘Dr Doom’ and becomes the main villain of the Fantastic Four. The four heroes are welcomed by the public more than any other super hero and must deal with this attention, while also trying to save the world. Outside of Alba’s abysmal performance, the rest of the cast is quite good. I forgot how good Chris Evans was in this role. He is imprinted in my mind as Captain America now and it is hard to remember he was so good as the arrogant Human Torch. Johnny is the complete opposite of the character he plays in The Avengers films, but Evans is equally as good. Ioan Gruffudd is ok as Reed, not much to say about him either positive or negative. Michael Chiklis is having a lot of fun as Ben ‘The Thing’ Grimm. He had campaigned for the role to Stan Lee for some years before this film was made, so it is clearly a passion project for him. He is good, I just wish they had found a better way to show The Thing on screen. The suit he is wearing looks like rubber, not stone. Chiklis’s enthusiasm for the role deserved a better outcome that the plastic suit he is forced to walk around in for the majority of the film. One of the things I really enjoy about the Fantastic Four is that they are one of the only super hero groups to be accepted by society. Where heroes like the X-Men and Spider-Man are considered vigilantes, the Fantastic Four are embraced by their home city of New York as heroes becoming household names and celebrities. It was an interesting change to see this group have to deal with paparazzi rather than police chasing them constantly. This film was a big letdown though. I would really like to see the Fantastic Four done right so I can figure out if this super hero family are just weak characters or just a victim of poor film making. I wish the rights to this and X-Men would go back to Marvel, but as long as these films are making money, I doubt it will ever happen.